If you recall, I posted Fables for the Internet Generation. There I recanted some of the many fables my mentor, aSEOp, told me as he guided me through the often treacherous internet. Today, children, I shall share some more. 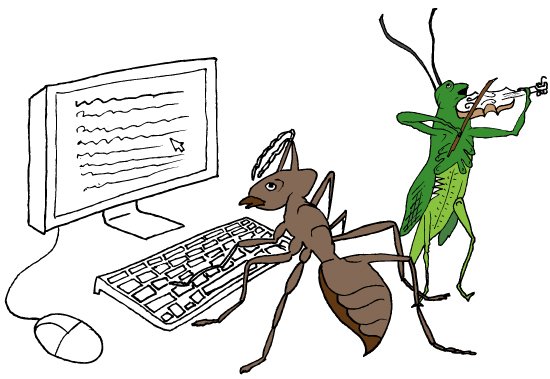 THE ANTS were spending a fine winter's day bringing their code up to the HTML 4.01 standard, fixing bugs on the site and implementing SEO strategies based on the analytics data they collected in the summertime. A Grasshopper, whose site was perishing with a lack of users, passed by and earnestly begged for a little cross-promotion to drive traffic to his site. The Ants inquired of him, "Why did you not update during the summer?' He replied, "I had not leisure enough. I passed the days in singing." They then said in derision: "If you were foolish enough to sing all the summer, you must dance user-less to bed in the winter." Prepare today for the wants of tomorrow. A FARMER'S daughter was starting up a new e-commerce site, when she fell a-musing. "The money this site will generate, will buy at least three hundred ads. The ads, allowing for all mishaps, will produce a two hundred and fifty percent rise in traffic. The traffic will result in the highest amount of conversions, so that by the end of the year I shall have money enough from my share to buy a new gown. In this dress I will go to the Christmas parties, where all the young fellows will propose to me, but I will toss my head and refuse them every one." At this moment she tossed her head in unison with her thoughts, and she dowloaded a virus which crashed her server, and all her imaginary schemes perished in a moment. THE NORTH WIND and the Sun disputed as to which had the most popular news site, and agreed that he should be declared the victor who could first get a wayfaring man to sign up to his site. The North Wind first tried his power and locked away all his content until the man signed up, but the more he insisted on signing up for content, the more the Traveler simply looked at TMZ, until at last, resigning all hope of victory, the Wind called upon the Sun to see what he could do. The Sun suddenly shone out with all his warmth. The Traveler no sooner saw the fantastic content than he read one article after another, and at last, wanting to comment on an item, signed up and posted simply, ‘lame sauce’. 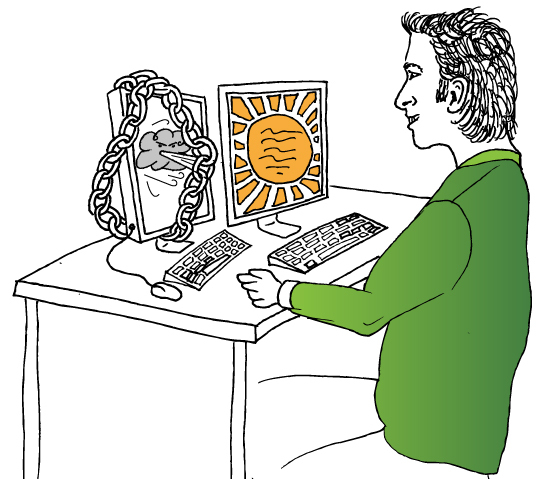 Having received an order for twenty websites from Princess Lioness, the Silkworm sat down at her computer and worked away with zeal. A Spider soon came around and asked to hire a room near by. The Silkworm acceded, and the Spider commenced her task and worked so rapidly that in a short time she created a hundred scraper websites. "Just look at them," she said, "and see how grand and filled with links they are. You cannot but acknowledge that I'm a much better worker than you. See how quickly I perform my labors." "Yes," answered the Silkworm, "but hush up, for you bother me. Your labors are designed only as base traps, and are destroyed whenever they are noticed by Google, and brushed away as useless dirt; while mine are ranked highly and viewed daily, as they are the sites of Internet Superstars." True art is thoughtful, delights and endures. A LION, fatigued by having shot a music video featuring choreographed treadmill dancing that quickly became a hit on YouTube, fell fast asleep in his den. A Mouse ran over his mane and ears, ripped off his idea in a television commericial for fizzy vitamins and woke the lion from his slumbers. He rose up and shook himself in great wrath, and searched every corner of his den to find the Mouse. A Fox seeing him said: "A fine Lion you are, to be frightened of a Mouse." 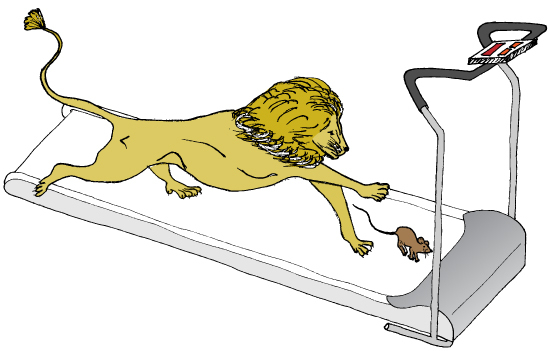 "'Tis not the Mouse I fear," said the Lion. "I resent his familiarity and ill-breeding." Taking little liberties causes great offence. If you enjoyed this, check out my original Fables for the Internet Generation post!